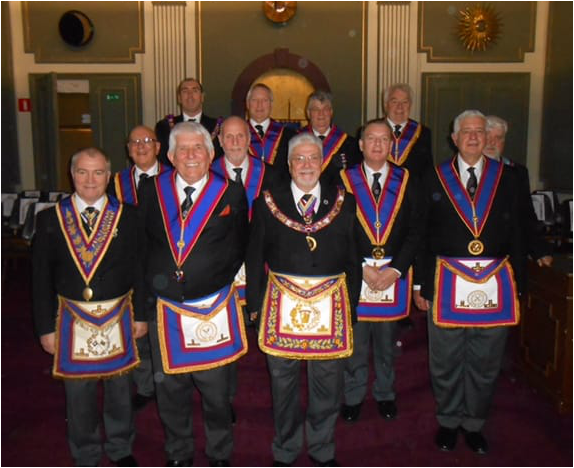 The Provincial Grand Master accompanied by a small, but select, number of other Essex Mark Master Masons recently visited the annual meeting of The District of Belgium (one of those "Districts and Lodges Overseas") which took place in Brussels. This was their 20th anniversary and the Pro. Grand Master, M.W. Bro. Richard Victor Wallis, JP, as well as others from Mark Grand Lodge were also in attendance. ​ The weekend proved a great sucess and an excellent time was had by all. It is not known how many mussels, Belgian chocolates, pancakes or, indeed, local brews were consumed, but we are sure there were more than a few. The weekend was self funded by all the attendees but the PGM was still able to "encourage" the brethren to donate a further £170 towards the 2017 MBF Charity Walk. The button is a link to the Belgian website and, given its' proximity and ease of travel to, must be of interest for some to attend.